But like the hot food that’s served in-house, the packaged snacks and sodas are a great pick-me-up. They are at the center of the already bustling, 3-week-old cafe, and it seems like the place is smoothly transitioning into a neighborhood favorite. There’s a really pleasant back patio complete with requisite orchids from opening day, a few lounge seats and a square-shaped patio with bench and table seating lining the walls. Li Ping runs the show, as I’ve noticed she’s a cook, expediter as well as sometime-server. The urgency she brings to my Friday night visit is not lost on the ambiance, either, but it’s exciting. Named after the town in southern Taiwan where owner-cook Li Ping is from, Pingtung struck an internal chord because while I’m Taiwanese, both of my parents are also from the south part of the island. Of course, all of this became somewhat irrelevant once I looked at the menu, which is a mishmash of Chinese, Taiwanese and Japanese, with dashes of Korean and Vietnamese. Like all cafes in the San Gabriel Valley (or even Momofuku Ssam Bar in New York), every table comes with a bevy of condiments. Sriracha, soy sauce, salt, pepper, sweet chili sauce and dumpling sauce (soy with vinegar, for sure) accompany napkins, chopsticks and angular soup spoons. The price points are more than reasonable for what is transported to and ultimately transplanted right in the middle of the funky shopping district part of Melrose. The consistent quality despite the wide range on the well-curated menu betrays that this is not Li Ping’s first restaurant. I have lived in Los Angeles for over a decade and I still have friends I have not successfully schlepped out to San Gabriel Valley for dim sum, for both distance and weekend awakening requirements (dim sum is usually available only on weekend mornings to early afternoon). If you’re the same, Pingtung may also be your answer. They open until 11 PM, and your friends were probably not ready for the chicken feet in black bean sauce or the pork knuckles in ginger, anyway. 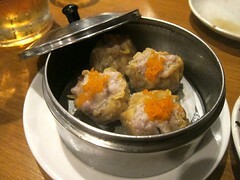 Shrimp dumplings, radish cakes, chicken shumai, sticky rice tamales, spring rolls, stuffed mushrooms, pork encased in tofu skin, panfried pork or steamed BBQ pork buns are amongst almost twenty varieties of dim sum. If you could name the overall American favorites of dim sum, they’d probably be right here, without too much Americanization. The Taiwanese dishes, such as the pea shoots with garlic and fermented bean and bean curd in vinegar sauce, were on the mark – and dare I say, just like Mom’s. Sure, there’s an emotional attachment (these were dishes I was eating at home for dinner with my family in Wisconsin while my classmates ate casserole), but let’s just say how little I was expecting based on Pingtung’s outpost on Melrose alone: Not much. 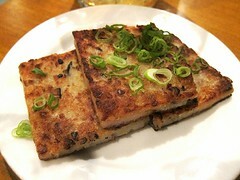 The Scallion Pancake, a Taiwanese classic, was more than decent. The texture, a crispy outside with an almost buttery, pull-apart inside also translated to their sweet dessert flatbread version, which comes topped with mochi ice cream. But there’s so much to cover: There’s not just Tonkotsu Ramen, but excellent Spicy Miso Tonkotsu Ramen with thin, bitey noodles – and chicken varieties available on both. If you want chicken curry (it’s really tasty), they have that too – as well as a rotating variety of spicy rolls and dressed sashimi. Feeling like a sandwich? Banh Mi sandwiches come with a variety of fillings and with a side du jour. Feeling like something over rice? They’ve got Mapo Doufu (Spicy Bean Curd Home Style), Paiku Pork Chop and even Galbi BBQ Beef. While I haven’t tried these, I noticed pretty generous, un-L.A. portions coming out of the kitchen and very satisfied diners bent over bowls of them all. The best thing about their drink menu is, like the food, the variety. Width over depth, though both menus stop just short of trying to do too much. 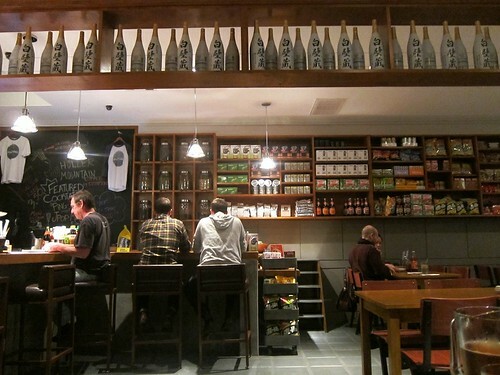 There are many teas – a multitude as compared with the choices you get at SGV dim sum (flower or oolong) – but there are also beers on tap, sakes and Stumptown coffee. The 5 taps they have aren’t the fancy craft beer kind but they’re enough – with Kirin, Sapporo, Stella and Negra Modelo rounding out the light beer selection Asian food is meant to be enjoyed with. If you so please, there’s also shochu and wine. 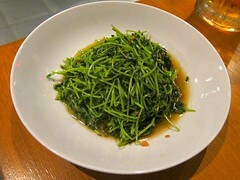 The success of Pingtung could be the trickling down of the phasing out of the offensive “ethnic” descriptor of food. While Bryant Ng (The Spice Table), Roy Choi (Kogi, A-Frame, Sunny Spot) and Kris Yenbamroong (Night + Market) have received mainstream recognition for their respective Asian culinary prowess in Metro L.A., Pingtung isn’t trying to revolutionize anything, but trying to serve Asian favorites in a previously unattainable location to an audience that’s finally ready, willing and curious. Bravo, and long live the Asian cafe. This entry was posted in beer, Food, Melrose, wine and tagged cafe, Chinese, coffee, Food, Japanese, Korean, Li Ping, Melrose, Pan-Asian, patio, Pingtung, ramen, Stumptown, taiwan, Taiwanese, Vietnamese. Bookmark the permalink.